Mixed Martial Arts is continuing to grow on this side of the water and the UFC has fast become the number one promoter in the sport. 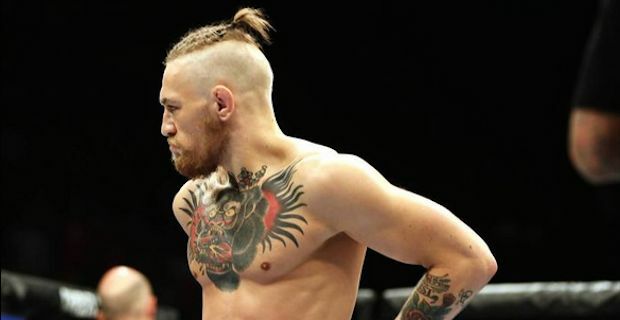 The UFC has had a number of huge stars in the form of martial arts luminaries like Georges St. Pierre, Randy Couture, Ken Shamrock, Anderson Silva and Brock Lesnar but it is looking like the world is witnessing the birth of UFC's biggest star ever in Irish fighter Conor McGregor. McGregor, aka The Notorious, currently fights at Featherweight and has shot up the rankings to the number 5 fighter in the division in double quick time since joining the UFC in February 2013. Since then, he has had 4 fights where he took a decision win over Max Holloway as well as first round knockouts of Marcus Brimage, Diego Brandao and the highly rated Dustin Poirier. He learned his trade fighting in Europe and he fought in the Cage Warriors Fighting Championship promotion. He made waves in Cage Warriors in both the Featherweight and Lightweight divisions, winning 8 straight fights on his way to holding titles at Featherweight and Lightweight in 2012. All this momentum brought him to the attention of UFC chiefs who went and signed him immediately. His real appeal though comes from the X Factor which has amassed a huge army of supporters in and out of Ireland. Often, McGregor's uses words and mind games to great effect and is reminiscent of Muhammad Ali in his prime. He often delivers killer one-liners and accurate fight predictions. He is very good at gaining a psychological advantage over his opponents before he even steps in the ring and it is something that fight fans absolutely love meaning that The Notorious is a cash cow in the making for UFC brass. Since joining the franchise, he has wasted little time in calling out every single fighter in the division including long reigning Brazilian champion Jose Aldo. After his stoppage of Poirier in Las Vegas, McGregor said "You know what's next. That title is next!". UFC chairman Dana White has already called McGregor "bigger than any of the fighters we’ve ever had" despite him only having 4 fights and not holding any title as of yet. White is completely in awe of McGregor's ability to perform in the Octagon as well as entertain outside of it saying "I’ve never seen anything like this. You don’t see something like this, you don’t see somebody burst on to the scene and have such a massive impact." McGregor has been responsible for a significant revenue jump for the UFC in the form of increased traffic to its Pay Per View streaming service Fight Pass. He also guarantees rapid ticket sales on any event he is part of meaning his star potential is huge. With his undoubted skills inside the octagon and his huge charisma outside it, the UFC has a serious star on its' hands who they will need to handle with care. McGregor has the ability to do great things in the sport and he could help the UFC reach a more mainstream audience as a consequence. Watch this space and expect McGregor to be headlining some huge Pay Per View events in the very near future. There are no guarantees in this sport but one thing is for sure, it is going to entertaining watching this man progress.